Defoe's era saw much popular interest in the instructional handbook and behaviour manual. Forming a highly significant part of his own oeuvre, Defoe adopted this style of literature with great effect, allowing him to explore fully some of his more cherished – and sometimes salacious – subjects: religion, immorality, sexual intrigue, social order, education and the duties and responsibilities of a merchant. Earlier protagonists such as Isaak Walton (Compleat Angler) and Henry Peacham (The Compleat Gentleman) produced works – at least in their titles – that Defoe would later recall. But, ever the pioneer, Defoe broke new ground by extending the genre to business and the professions. His The Complete English Tradesman offered very practical, human and shrewd advice to all those concerned in it, merchants, shopkeepers and apprentices alike. In The Family Instructor, among other handbooks, his innovative approach to the use of dialogue and fiction displayed a vividness and psychological acumen one would more readily associate with his novels – indeed its sales were beaten only by Robinson Crusoe, with new editions appearing well into the nineteenth century. 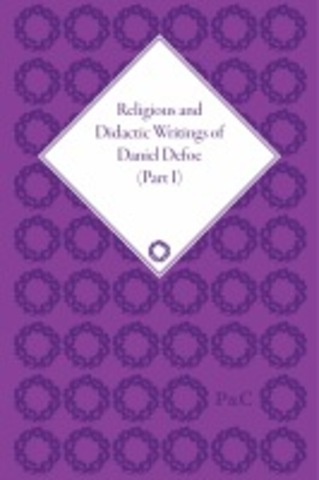 With his love of dilemma and paradox, exemplified in Conjugal Lewdness, his sharp observations on the blessings that education can bring – and the fatal consequences of its neglect – in Of Royall Educacion, the ten volumes making up Defoe's Religious and Didactic Writings are a feast for Defoe scholars and all academics of eighteenth-century history, religion and literature. Edited to the highest academic standards, the set will offer readers accurate texts and a wealth of editorial matter, including introductions, full explanatory notes and a consolidated index to the ten volumes.